1. Flat=The print is mounted on 3/8" fiberboard and laminated. Then the edges are trimmed and beveled ; you can select different edge colors (shown below) to match your decor. 2. Float=The print is mounted on 1/4" fiberboard and placed on a back frame. The result is an image that "floats" one inch off the wall. Again, you can select different edge colors (shown below). 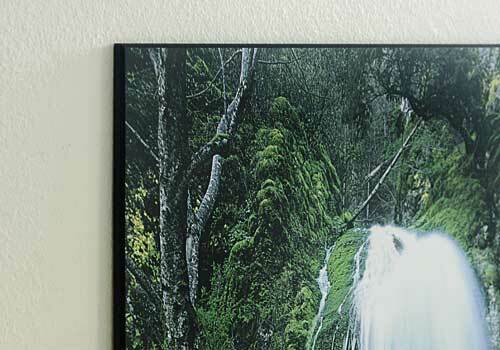 Notice the water fall picture lays flat against the wall. This presents a very tailored look. Click on the thumbnail for a larger view. 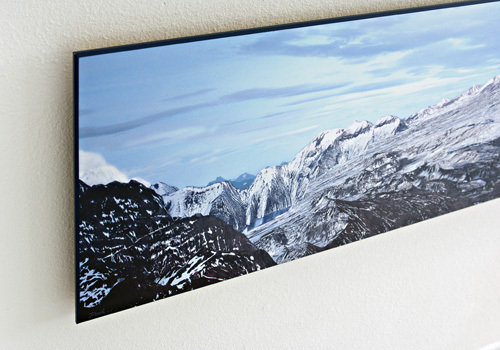 The Mountain scene is displayed about 1 inch from the wall. This costs a little more but dresses the image nicely. Click thumbnail for larger view. We take personal checks through mail and Pay Pal for credit. If you don't have a Pay Pal account, we'll be glad to help you get one. It's easy!